Day 31: Ready, Set, Go! I’m so excited! Today is Day One of a blog series I’ve decided to join over at the Nesting Place. In a nutshell, I’m committing to blogging for 31 days on a particular topic. Each participating blogger will have a unique topic. What’s mine? 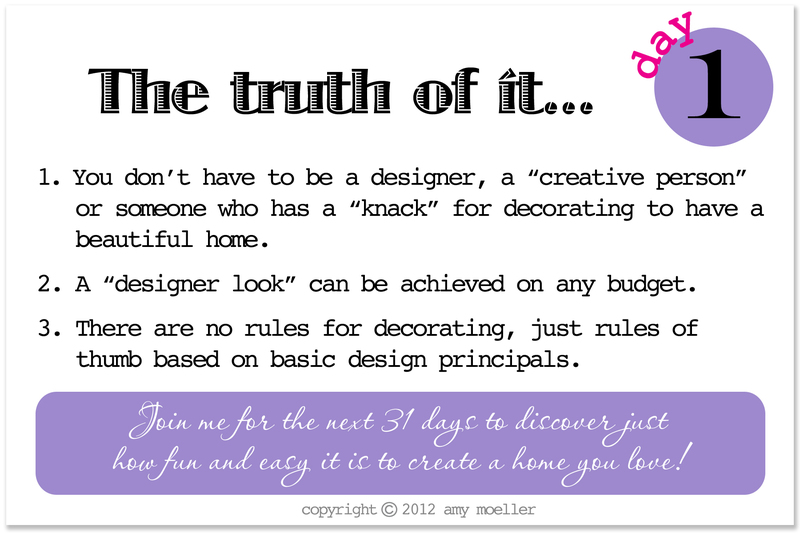 How to Decorate Confidently in 31 Days! I’ve taught so many workshops over the years and what I love best is the moment that comes at the end a class when everyone realizes that creating a beautiful home really is something that everyone can do! Each day I’ll introduce a quick topic/tip with a short assignment. Basically we’ll be covering decorating from A to Z – a mini version of Dish on Design’s Decorate Fabulously! Here we go…. Day 1: The Truth of It. It’s true. Believe it. You can create a beautiful home. It’s easy, it’s fun and it doesn’t take a lot of money. Best of all, you don’t have to have to have a “talent” for decorating. The interiors of all beautiful homes have one thing in common – their design started with the basic principles of decorating. These are principles that every designer knows and applies to their work each day. Over the next 31 days we’ll explore everything decorating and I’ll even throw in a fun assignment for those of you who want to do more. Get ready, because believe it or not, you’ll soon be making decorating confidently and ultimately saving time and money! Whether you love to decorate or have a fear of it, I think you’re going to have fun with this. Get ready, because over the next 30 days you’ll be looking at your home in a different way! Assignment: Dedicate a notebook or binder to decorating and gather-up some old design magazines and scissors for tomorrow’s assignment.